Over the weekend, I was in the mood to watch a movie, but wasn’t sure what. 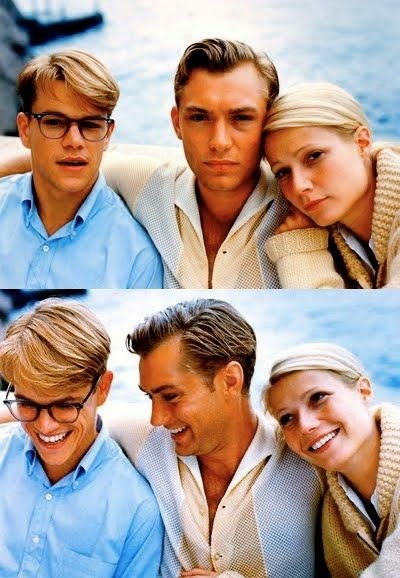 As I scrolled through my Netflix queue, I stumbled on The Talented Mr.Ripley—a modern classic and personal favorite starring Matt Damon, Jude Law, Gwyneth Paltrow, Cate Blanchett, and Phillip Seymour Hoffman. If the stellar cast isn’t enough to make you want to watch it, then the beautiful scenery, wardrobe, and set design surely will. It had been at least a year since the last time I watched the movie, so I decided it was the perfect choice for a cozy Saturday night at home with a glass of Rose. 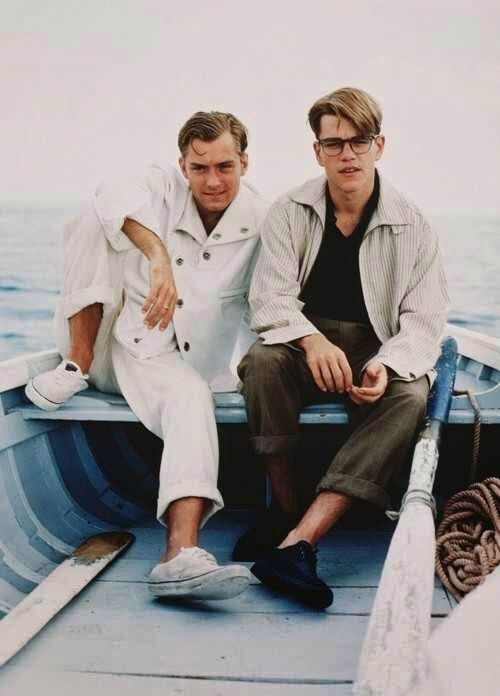 Set in Italy during the late 1950s, the film follows Tom Ripley, played by Matt Damon as he is sent by a wealthy New Yorker to retrieve his aimless, libertine son, Dickie Greenleaf played by Jude Law. 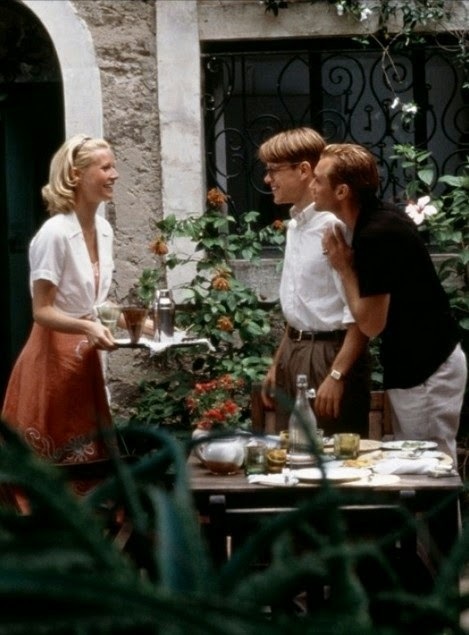 When Tom arrives in the sleepy Italian seaside village, he finds Dickie with his beautiful American fiancée, Marge, played by Gwyneth Paltrow and he proceeds to befriend them. We quickly find out that Tom has ulterior motives, many dark secrets, and a sinister side. The plot, as well as the scenery, unfold beautifully. I’m sure most of you have probably seen this film and consider it a favorite as well, but if you haven’t you should be sure to watch it as soon as you can! The suspenseful plot is sure to stay with you for a while. It’s hard to get it out of one’s head, but the beautiful European scenery, splendid interiors, and the wardrobe, especially Marge’s are sure to leave you feeling inspired as well. 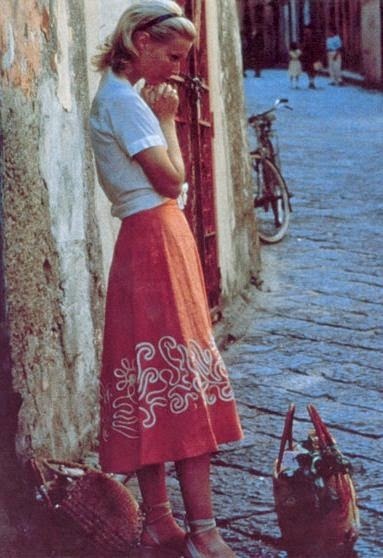 I've never seen it, but it does look like her clothes are amazing! I'll have to check it out. I've never seen this, now I want to! 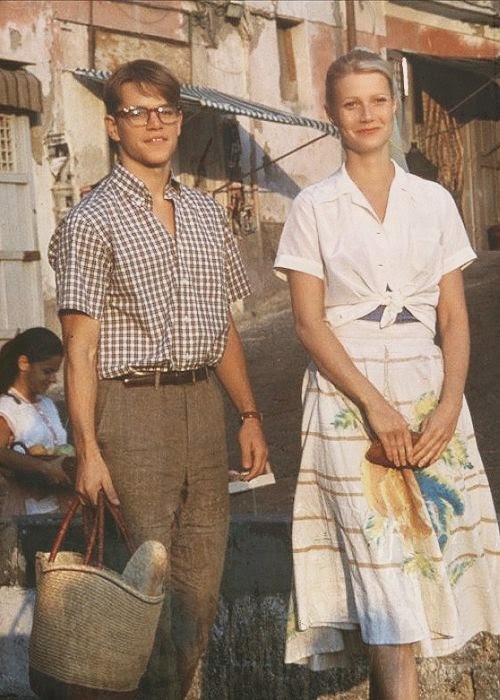 I love the fashion in the fifties. I wish it was still "stylish" to wear modest, yet fashionable clothes. 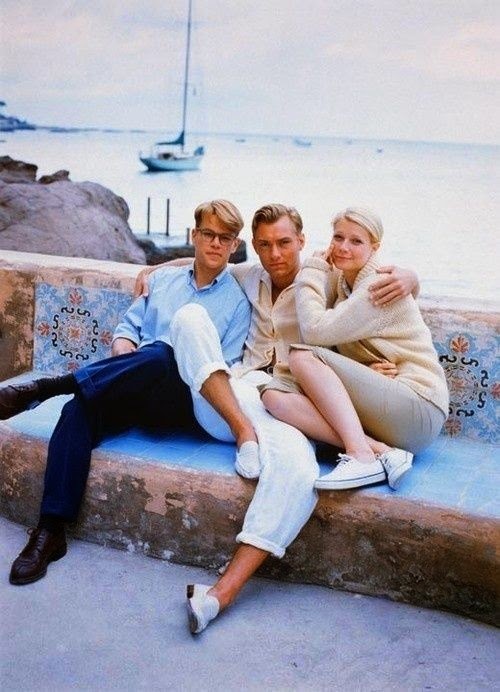 Everyone looks so classy. Wow, such gorgeous shots! I've gotta add this to my queue! I remember this movie but haven't seen it in awhile. I do recall it was a "pretty" movie. My niece is going to Italy for the summer. Any idea what I should ask her to bring me? I absolutely agree this is one of the best movies of our era for all the reasons mentioned -- you summed it up brilliantly! Timeless story of adventure & innocence that existed not long ago in the grips of classic film noir. 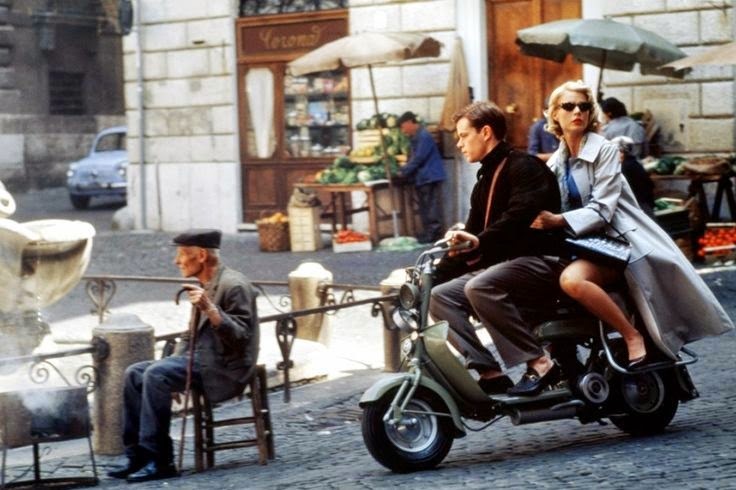 The images you posted have gone directly onto my Pinterest board 'The Good Life'. I could watch it over & over, and will put it at the top of my Summer Movie list! Thank you! You should see The Two Faces of January.